LeBron James graduated from STVM in 2003. He spent four memorable years playing basketball and winning three state championships and one national championship under the leadership of Coach Dru Joyce. LeBron was also a member of the Fighting Irish football team his freshman, sophomore and junior year. LeBron was inducted into the STVM Athletic Hall of Fame on August 9, 2011 with his teammates and lifelong friends: Dru Joyce III, Willie McGee, Romeo Travis and Sian Cotton. LeBron and his teammates have a special bond that was best told to the world in the movie More Than a Game and also in the book Shooting Stars by Buzz Bissinger. LeBron graduated from STVM and immediately entered the NBA draft. He was selected #1 in the 2003 draft by the Cleveland Cavaliers. From a fun loving teenager to NBA Superstar in an instant, LeBron’s life changed quickly from his humble upbringing in Akron, Ohio. His commitment to his alma mater, however, has never wavered. 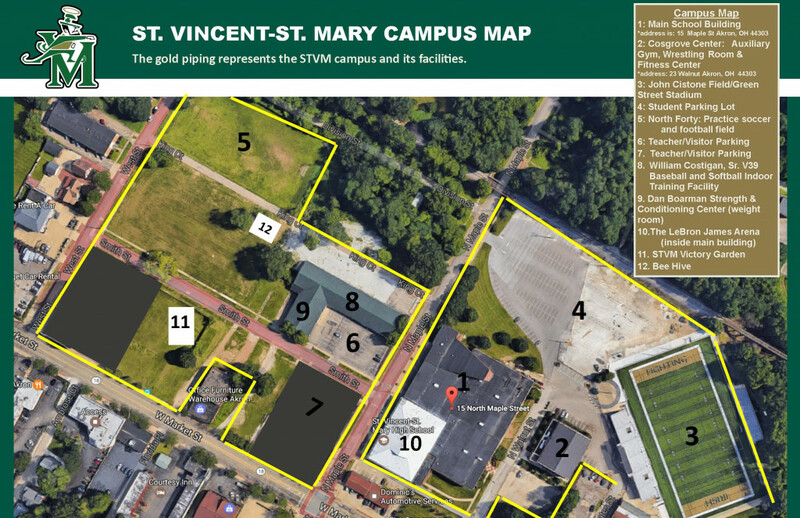 Coming home as an NBA Champion in 2012, MVP and Olympic Gold Medalist, STVM held a congratulatory assembly for their “Chosen One.” The theme of that assembly revolved around LeBron’s “I Promise” campaign. At that assembly, LeBron surprised the school by making his own promise ; to outfit every athletic team with a new Nike uniform. The athletes were delighted. 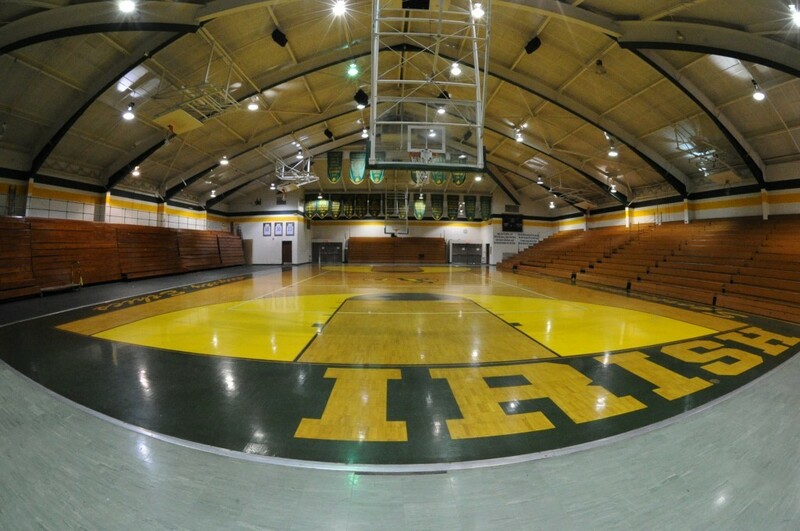 In 2012, LeBron also pledged $1 million to renovate his old stomping grounds. 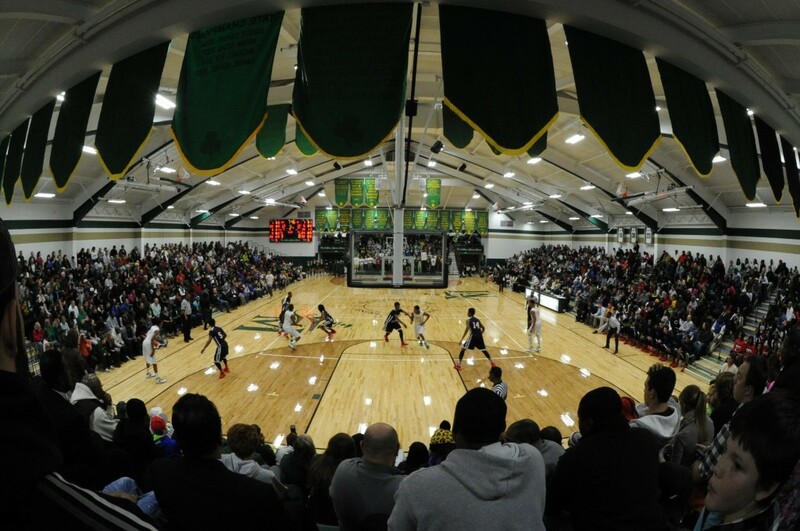 The completion of The LeBron James Arena was marked by a ceremonial grand opening on December 14, 2013. Click Here to watch a video of the floor installation. 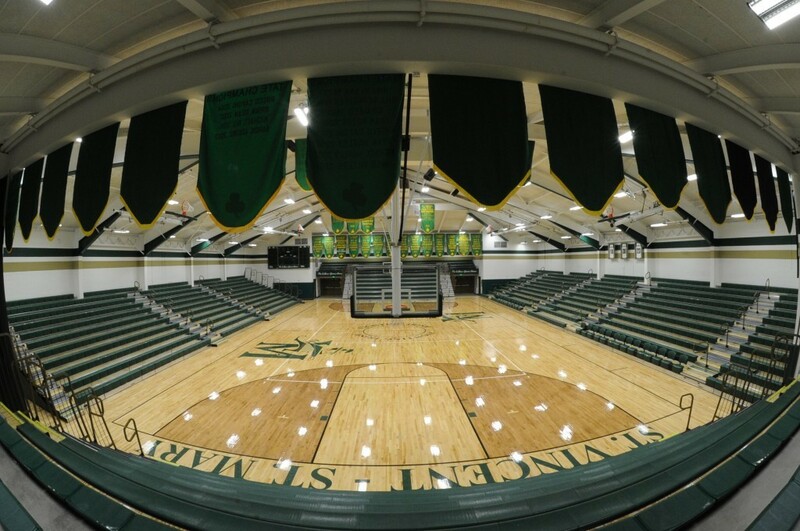 New bleachers throughout, adding an additional 200 seats, raising the capacity to 1,831. The south endzone includes a new mezzanine section. Six NCAA model, hydraulic baskets supplied by Spalding. New lighting that is 8-times brighter than what had been in place. Renovated locker rooms for both the boys and girl teams. Renovated offices for the boys and girls coaching staff. A new athletic training treatment room. A “dedication wall” in which James’ time at STVM, along with his four close friends who completed the Fab Five – Dru Joyce III, Romeo Travis, Willie McGee and Sian Cotton – is impressively chronicled in pictures.